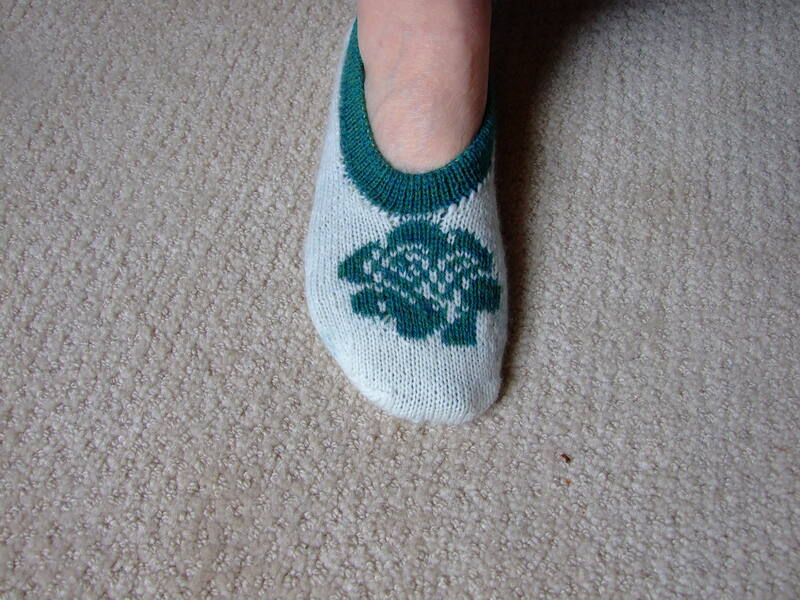 I designed my Double Knit Cozy Slipper Socks so I could use the “Slipper Toe” pattern I stumbled on to while playing around with short rows. I am delighted with the results. And …. they feel so…… good on my feet. My husband even said he might like a pair for next winter. Hummmm… , maybe I could chart an elk on them. There were nine on the hill behind the house this morning. 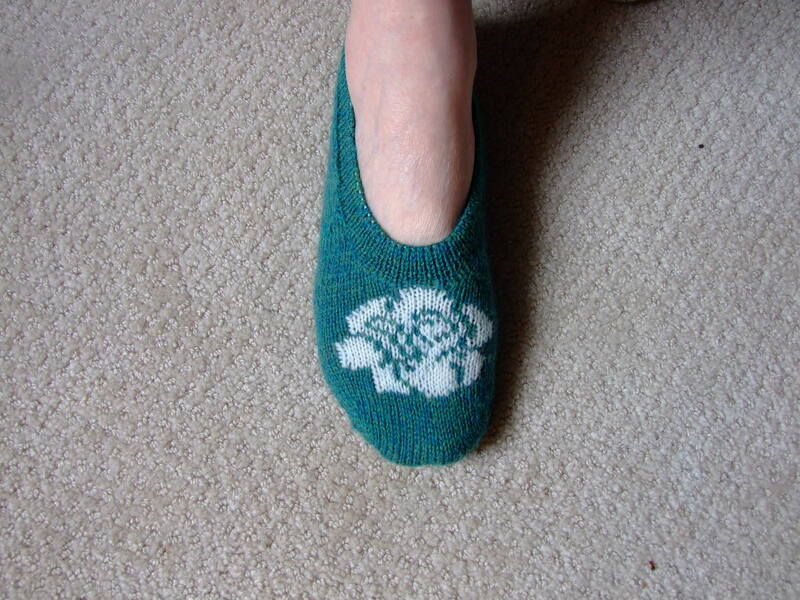 Here are the pictures of the ballerina slipper. I will post the pattern as soon as it it off the press. You will notice that I incorporated that rose I used in “Charting Your Knitting Ideas.” Next time I’ll turn it around so I can see it. Beside using the Slipper Toe, I was able to use several techniques for this project. I picked up my stitches for the ribbing as I went- yes, picked ‘um up on the fly. I used the invisible cast off, which provided me with a tube through which to slide my elastic thread, for a nice fit. Combine that with the fun of double knitting, and what more could a girl ask for? You may purchase the pattern in my Etsy store. Click here. I thought I would share tip with those of you who might NOT have done a lot of Magic Loop knitting. Last night I was working on a pair of socks for my friend, and in the process of putting pictures of her Doxies on the leg portion, using the Armenian weaving method, I discovered that if I divided my sock into smaller sections, I didn’t have to worry about the ” laddering” at the needle divisions. It allowed me to lay the adjacent section out flat before proceeding to the next one to the left. Here’s the pictures of what I mean. These three smaller sections (three Doxies, sections A, B and C) of stitches allowed me better control over the tension of the floats, especially between the sections. It also saved me from having to use markers to identify the beginning of the chart, or new dog. Hummmmmmmm?? Why, I might be able to use this method as if I had double point needles. I think I am going to opt for a 47 inch next time I order my needles from KnitPicks. I could , of course, pull the cord out at every section, but I guess I’m not very keen on pinching and pulling. This cast off looks very professional. It makes your sock look like it came right from the factory. 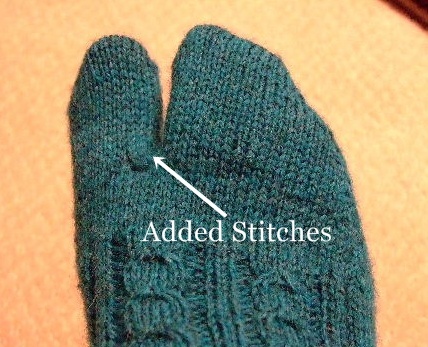 I learned this wonderful technique from a book by Peg Arnoldussen, entitled, “Essential Techniques for Serious Knitters.” The book also includes working with “steeks” as well as various finishing tips. It is inexpensive and well worth the money. You can get her book here. Just a PS. My socks are modeled on a sock form I made from an old sock. Just stuffed it with fiber fill, and made a heavy folded paper ring to go in the leg part. It works great. Tabi Socks You Can Wear with Your Floppies!! My most recent post showed you a method of shaping your toe-up socks by starting them off with a waste yarn crocheted chain. 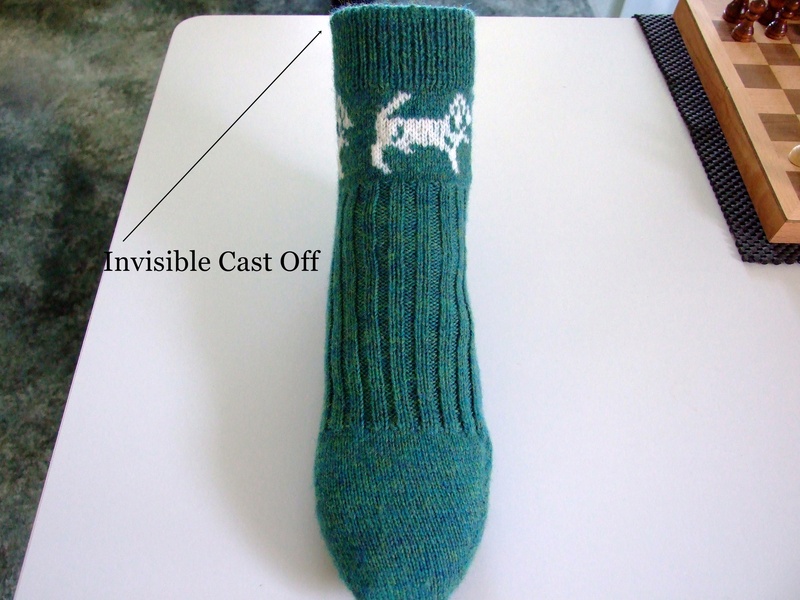 Taking that one step further, I thought I would show you the Tabby Sock I designed using the same method. As you can see in the photo above, I measured the width around my big toe about a half inch from the tip. Dividing this in half gave me the CO width for my Toe Tip Cap for this section of the Tabby Sock. Calculating the stitches using my gauge (9 sts , and 12 rows per inch), I made my chain, adding 10 additional chain sts for something to hang on to, and proceeded to pick up the number of CO stitches required. Next, I worked 3 short rows each side to make my cap. Picking up the stitches off the chain, and I knitted in the round with no increases till my toe measure about 2 inches. * This measurement was 1/4 inch longer than the inside length of my toe, to allow for the two sections to meet in the middle of the gap. Not allowing this extra length would have made it uncomfortable to wear. Leaving a long tail, I cut the yarn, put the live stitches on some waste yarn and proceed to the next toe section. 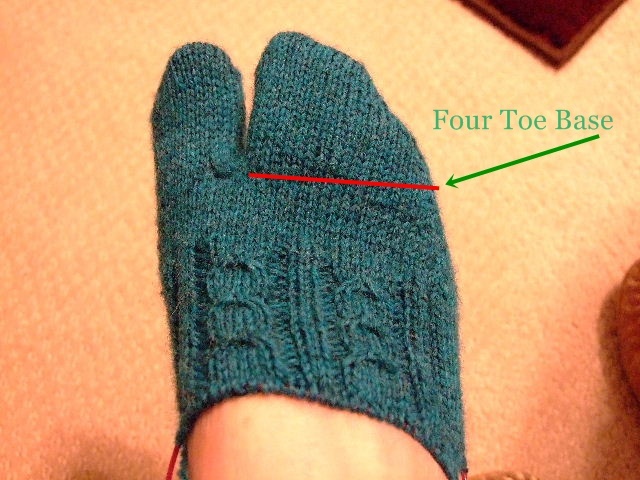 The four toe section Toe Tip Cap is made exactly like the pattern in this tutorial-More toes tutorial, the only difference is that you only need to measure the width of the first two toes adjacent to the big toe, to calculate your CO stitches. 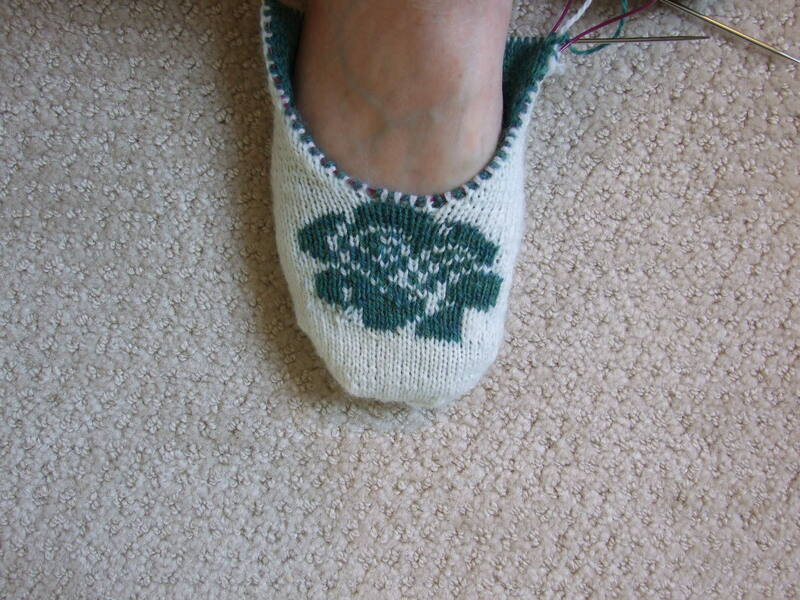 Work the increases on one side only, till you have the number of stitches needed for the width of the four toe base. See below. Once this section is done, place it on a piece of waste yarn so that it will be flexible. Do not break you yarn. 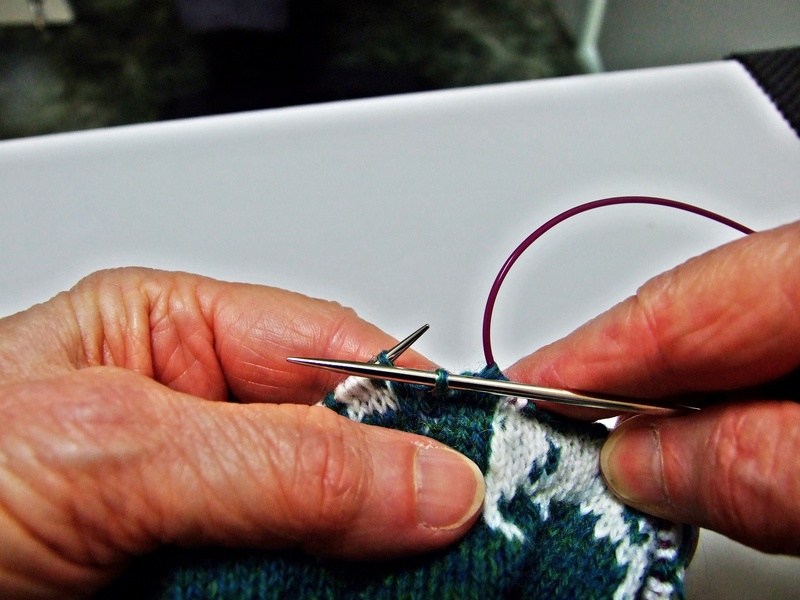 Now, using the tail from your big toe section, Kitchener stitch the big toe and four toe section together, using about a third of the stitches from the big toe section. Secure the yarn, and weave it in. Next, pick up the stitches off the waste yarn from both sections. Knit around, picking up at least 3 stitches where the section are joined (front and back). These extra stitches make the sock more comfortable to wear. Try it on! If it needs a few more stitches in the gap, this is the time to do it!! From here you can proceed with whatever style sock you want. Hummmmmm???? I wonder if this could work for mittens, too?? I can just imagine have all those little finger tip caps lying around. 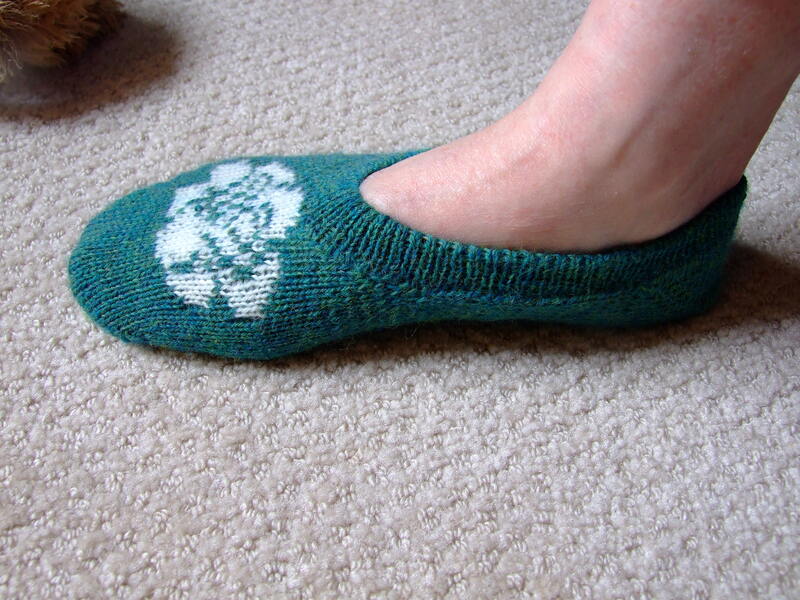 The short row tutorial I presented in “Short Row Heel with a Tweak,” describes a method that can be used for toes as well. 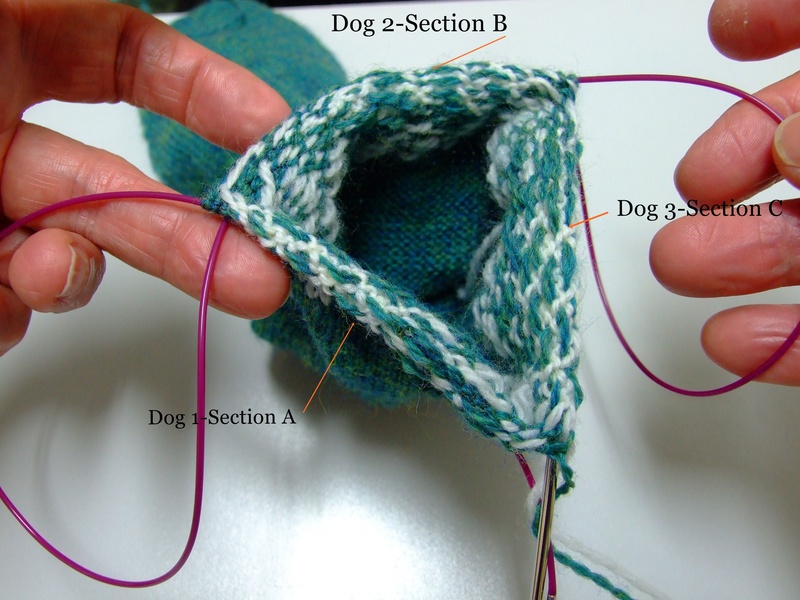 The original chart for the heel in the tutorial can be used to form the toe of the same sock. 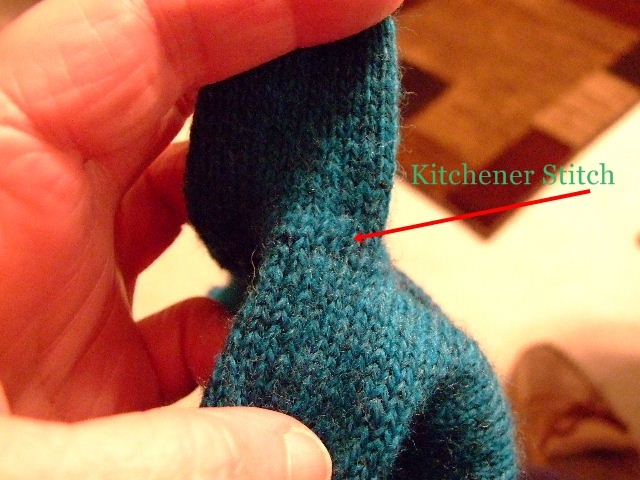 The ONLY difference is that if you are working from the cuff down, you will need to close the opening between the instep and toe section, or the sole and toe section with the Kitchener Stitch. 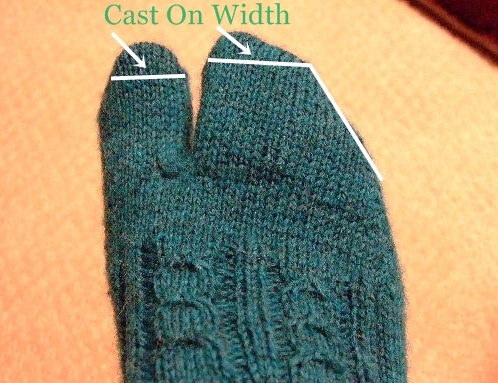 Below is a picture of standard short row heel shaping. 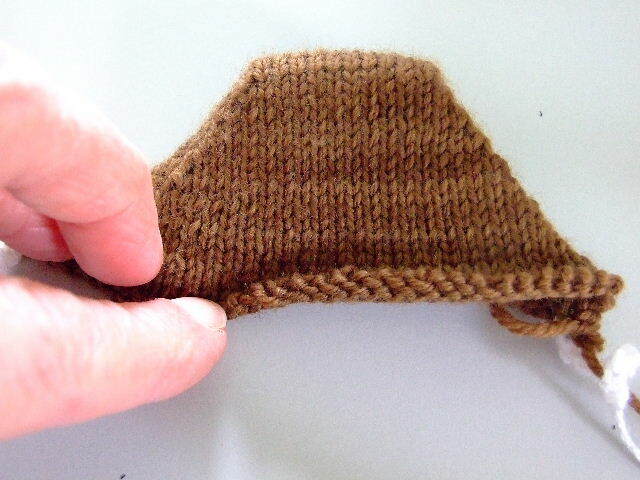 Normally, if you are doing a cuff down sock and you can use this shaping for your toe also. You simply work the foot section down to within about * two inches, and (having made you decision on what side you will make the closure) you will begin to work the chart as before. When finished, you simply use the Kitchener Stitch to join the live stitches on your sole or instep section, to the live stitches on you toe section. Did I say NORMALLY? Well, one day as I was practicing one of those “normal” heel patterns (having started it on a crocheted chain, so I could pull it out), it suddenly dawned on me that if I just picked those stitches off the chain I could use it as a toe and start knitting the instep portion of a toe-up sock. Wow!! That meant no more winding yarn around two needles, or some other funny little cast on. I was all for that! 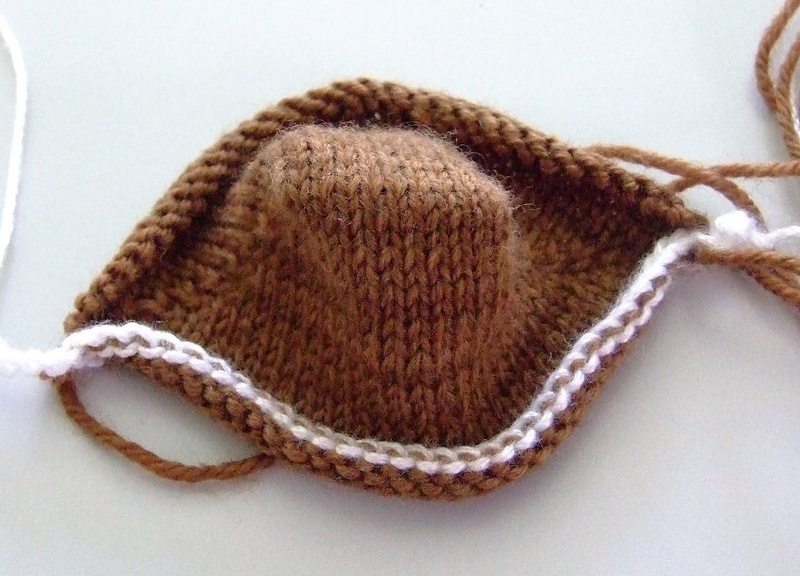 From that moment on I was on a mission to discover how many other shapes I could make with those little short rows. I actually found myself beginning to think of toe shapes in the middle of the night. Yikes!!! Now I know I’m losing it! But it has not been for naught. I have been having fun designing new shapes for toe-up socks and hope to share them with you as they are developed.